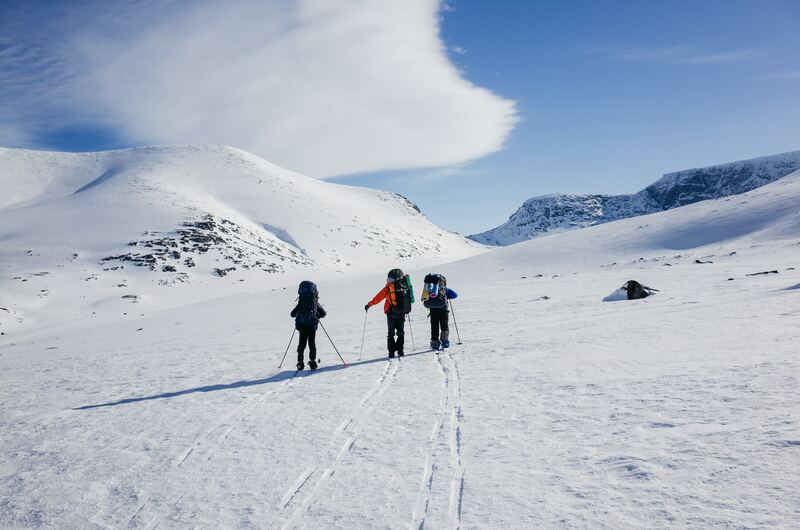 You may have heard the popular phrase “earn your turns” in reference to skinning, hiking or snowshoeing up mountain terrain and skiing or snowboarding down. Skinning up resort terrain has become a popular way to access mountain terrain on Alpine Touring skis (AT backcountry skis) and splitboards (backcountry snowboards) – especially early season when not much backcountry terrain is open. It’s also something many locals do for exercise before and after work during the winter months. All Summit County resorts are on U.S. Forest Service land. This means the terrain is open to the public (within the guidelines of ski area special-use permits). Arapahoe Basin Ski Area, Breckenridge Ski Resort, Keystone Resort and Copper Mountain Resort are all open to uphill access. Each resort allows uphill access before and after resort operating hours, clearing the trails for anyone who prefers skinning, hiking or snowshoeing. Before heading out at sunrise or dusk with your uphill travel gear — alpine-touring skis or splitboard — here’s a look at the rules for all four local ski areas. Access is open daily on the River Run, Spring Dipper and Schoolmarm trails. There is no uphill access on North Peak or The Outback. No pets, travel only before 8:30 a.m. or after 5 p.m.
Copper expects to open for skinning by late December. Travel before 9 a.m. on weekdays and 8:30 a.m. on weekends. After 5 p.m. all week. Copper requires all uphill travelers to get a free access pass and reflective armband. The passes are available at the lower ski patrol room located next to the American Flyer lift (behind Jack’s), from 5 a.m. to 5 p.m. during the winter season. Designated routes start from East Village, Center Village and Union Creek. All routes take travelers to the Janet’s Cabin hut. See the Copper Mountain website or drop by the patrol room for details on the routes. Dogs are allowed but must be under voice control. Owners must pick-up after pets. Allowed to travel uphill when lifts are spinning. Uphill access is restricted to the eastern edge of High Noon run found between the base area and Black Mountain Lodge during resort hours. Access above Black Mountain Lodge is prohibited during operational hours. “The Beach” and upper parking lots are locked at 6 p.m. daily, so late-night and early-morning travelers need to use the upper admin lot near the Summit Stage bus stop. Uphill access is only permitted outside of public operating hours – from 5 p.m. to 8:30 a.m. All uphill users must be clear of the mountain by 8:30 a.m. Peak 7: Fort Mary B > Claimjumper > Lower Forget Me Not > top of Independence chair – return down the same route. Springmeier > Upper 4 O’clock > Lonewolf Access > T-Bar Hut – return down the same route. All uphill guests on Peak 8 must be at or below Vista Haus by 7:45 a.m. due to ski patrol work. Peak 9: Silverthorne > Lower American > Bonanza > top Beaver Run chair or top of Mercury chair – return down same route. Peak 10: Silverthorne > Red Rover > Crystal > top of Falcon chair – return down the same route. Peak 6: Closed to uphill access for the 2017-2018 season. Stay towards the center of the trail. Guests should maximize visibility and position themselves to be visible from above; wear reflective or brightly colored clothing. Once up the hill, no one may ride a lift without a valid ticket or season pass. Other than Service Dogs, dogs are not allowed. Fat tire biking and/or mountain biking is prohibited on the mountain during the winter season – both during daytime and nighttime operations. For more information about uphill travel, please visit the resort website of your choosing to see all guidelines/rules for that area!